Want to buy a Tesla? Use my referral link! 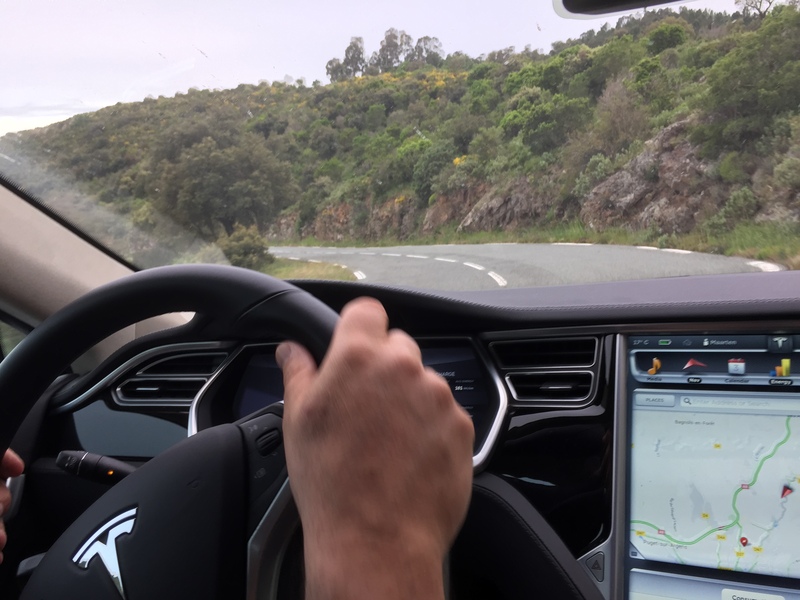 Last week we went on holiday with our Tesla Model S for a second time to the south of France. 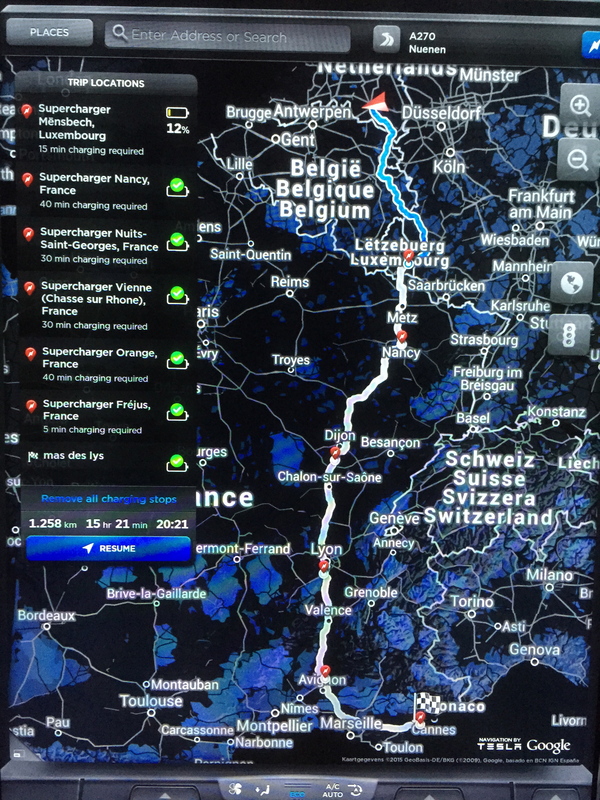 We successfully used the new 6.2 software, which plans the navigation with stops at superchargers completely automatic and optimal, and also the route is finished: we have driven the 1250 km from Helmond to Frejus in one day, in about 16 hours. We did not have to take any detours through Germany and Switzerland, but we could take the classic Route de Soleil. We had picked our holiday destination to be a place close to the SuperCharger (SuC), of Frejus, at Roquebrune, at about 15 km distance of the SuC. Ideal: every 2 to 3 days we could charge up the car completely. Last holiday we were about an hour’s drive away from the SuC at Nimes, and that is not so handy: the charging at a hotel with a regular 220 V plug is possible, but terribly slow… In this holiday we have driven a total of 3000 km (1865 mi), with an average use of 185 Wh/km (300 Wh/mi), and with only the costs of the toll on the main route: the electricity of the SuC is free! During our holiday we went over a milage of 50,000 km (31,068 mi; we have the car since September 2013, so almost 2 years). It is then time again for a little update. In previous blogs (all in Dutch) about the first weekend, the first month, the first 10,000 km, after the first year and my first trip in a foreign country, I have mainly written about the usage of the car, and the attention it draws. Neither of these have changed: the car still drives wonderfully, we have not had any more technical issues, the car still draws attention, although in France it is seen as even newer than with us in the Netherlands. The tires are doing a bit better, I try to restrain myself. What I do notice is the role the software plays for the experience. On the forum rumors often buzz when we expect a new software version. Every time after a (free) update it is pleasant to see new features. Because of this you feel the car really changes a bit. One of the updates was the addition of the Calendar feature: when you get in the car, automatically your schedule is synchronised from your mobile phone to the car. And every morning when you get in the car, it shows you the appointments of that day on the screen. And if you then have filled in in your calendar an address, you only need to click on it and the navigation will automatically navigate there (it does not yet drive itself 🙂 ). I found it a pity that a conference call in my agenda was not recognised and it seemed handy to me that you could then phone, simply by clicking on the telephone number in the appointment on the screen. 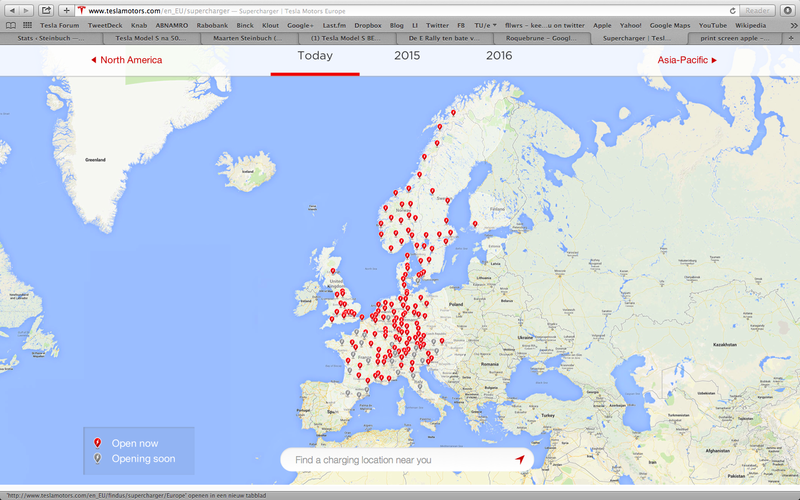 I mentioned this to someone from Tesla from Tilburg and 3 weeks later we all got an update with this new feature! Cool, right? And indeed very handy, I often use it when I have a conference call during my trip. The last software update is version 6.2 of a few weeks ago. 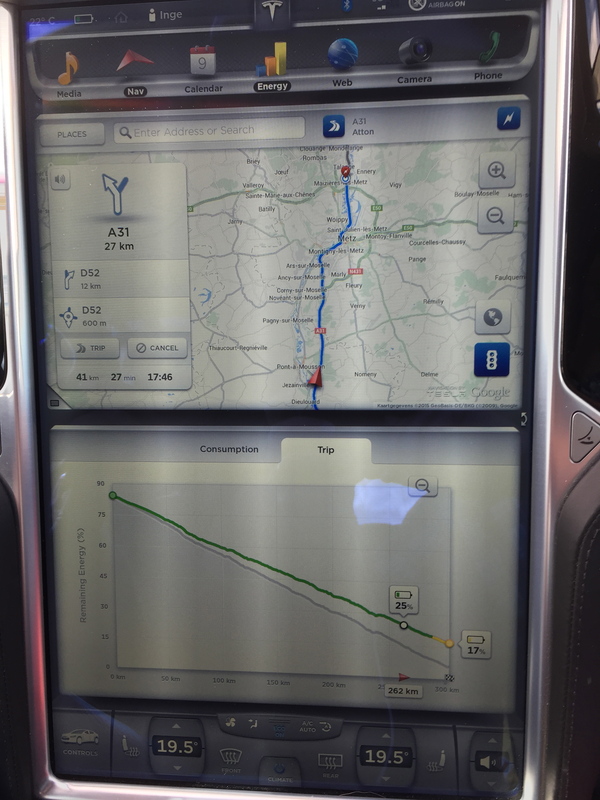 The navigation now has the feature that it calculates a longer journey through the SuperChargers and it also optimizes total travel time: no charging up for 1 h 15 mins on one spot and 5 mins at the next, because the more loaded the battery, the slower the charging. On the trip to the south of France we gratefully used this feature. The image here shows how that works. The button ‘trip’ is also very handy: it gives an overview of the entire journey, and the closer to the final destination, the more it zoomes in. Some improvements are necessary, for example it would be handy to turn certain SuC off or to skip them simply by clicking on them. But that kind of improvements will come in future updates I expect. A few more experiences of the week of our holiday. Driving in the mountains and hills is truly a joy! To not have to change gears, and a huge traction. The smooth and relative silence, and with the power, very enjoyable! The power usage is very low if you keep the speed limited on the motor ways. 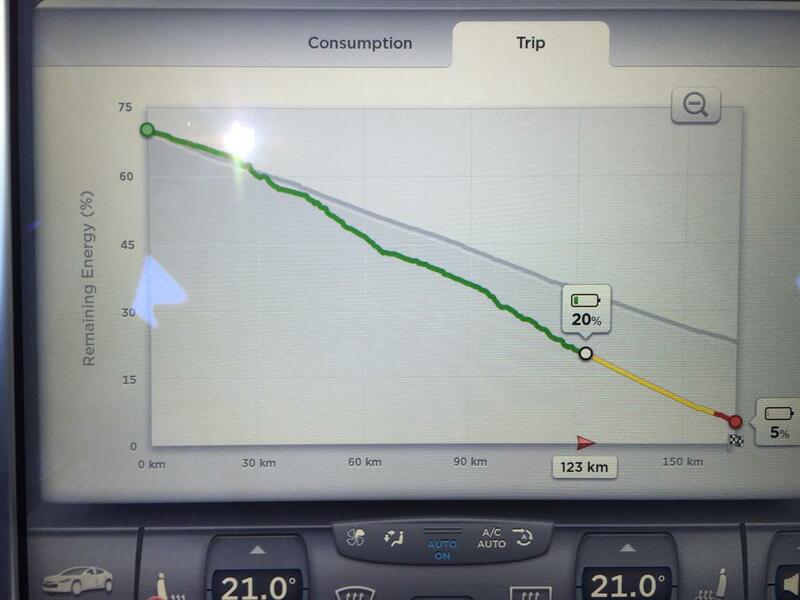 Since we have our Tesla, we usually drive a lot less fast: usually max. 110 km/h. Because of the tranquility and silence, and the measure and display of the energy usage, this is what the car provokes in us. The same thing we hear from other Tesla drivers. The acceleration is great of course, but the speed you limit naturally. It often makes only a few minutes of difference in arriving. In France the temperature was a lot higher, between 20 and 30 degrees C, which makes a big difference too. Our power usage was for the trip of 3000 km (only) 185 Wh/km, versus an average so far until now of 225 Wh/km over those two years. 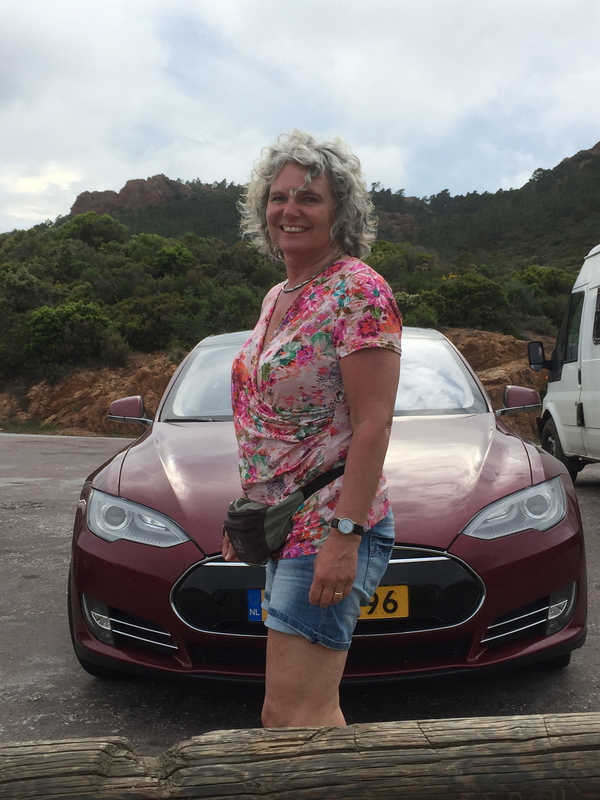 It is always fun to have an experience as we had on the seafront at Frejus: we were enjoying the evening sun together on a bench close to our Tesla. We see a young Frenchman walk off from his nicely dressed young wife (she’s wearing high heels as well), and we see him cross the street. He walks around our car, and I ask him if he knows the car (I got up straight away, leaving my wife in her summer dress alone on the bench). He answers no, and asks me if it has a V6 or a V8 engine. I answer, gesturing with my hands, the size of the electric motor, hidden between the rear wheels. Surprised he tells me that he really likes the car and did not know such cars also exist with an electrip setup.. well, enjoyable right! Look here for the planning later this year and in 2016. Summarising: the conclusion is the same as the one after the first 10,000 km: we enjoy it every day, it is a great car, and a wonderful showcase for the future of auto mobility. A gamechanger! Wonderfull experiences. My 82.000km’r are also a joy. I have spend more on this car then all my previous cars combined but ti’s worth it. Great to see your trips in these post. Have a wonderfull vacation. I am on my way to berlin! Nice story en fine to see that EV driving to holiday location in south of France is possible. I wonder if you also used airconditioning during your trip and, if so, how much this affects the mileage. We have had our model S for one year now and driven 50.000 km and are so happy with it that we have ordered a 70D also. Delivery during June look forward to our next trip to France. 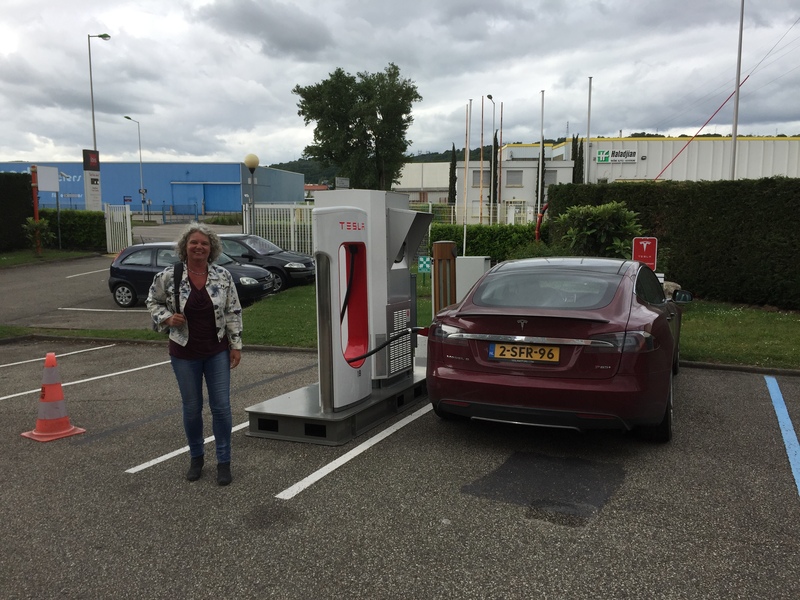 Ik kwam via het Twitter account van teslamotors op dit blog, en met verbazing herkende ik u op de foto ! U bent toch professor op TU Eindhoven als ik het goed heb ? In de maand mei een jaar geleden heb ik een kijkje genomen op de TU omdat ik zeer geïnteresseerd was in de automotive studie, dat gaat niet door wegens problemen met wiskunde. Nog vele jaren plezier met deze geweldige auto !